Dakota on the podium with the DC Autosport Crew for their first win together! Dakota Dickerson of San Diego approached the Formula 4 United States Championship Powered by Honda mid-season event with one goal-- to win-- and after 11 combined second and third place finishes, the DC Autosport with Cape Motorsports pilot finally put a tally in the win column. After a rough three rounds at Road Atlanta last month, both, Christian Rasmussen of Copenhagen, Denmark, and Teddy Wilson of Holbeach, England, returned to the staggered steps. Rasmussen claimed second with his Jay Howard Driver Development teammate Wilson rounding out the podium in third. Driving the white and blue No. 9 Stress Engineering Services RoxBalden machine Dickerson started pole-position in Race 1 after laying down the fastest lap time in qualifying. Dickerson slipped into the lead during the penultimate lap to win the Cameron Das Fast Qualifier Award presented by Worldeye, beating out Wilson by 29 thousandths of a second. After an aborted standing start due to a stalled car on the grid, the F4 U.S drivers lined up in a single file line for its second rolling start of the season. As the green flag dropped, Dickerson punched the throttle, pulling away from the field immediately. Rasmussen, who started in Row 2 in third, got the jump on Wilson to take second. Further down the line, championship contender Benjamin Pederson of Copenhagen, Denmark, charged from his P11 start to contend for a points finish. Staying in Pedersen’s draft, Jack William Miller of Westfield, Indiana, weaved through the field with Pedersen. The pair’s commanding start came to a halt after three laps. On Lap 4, Kent Vaccaro of Plattsburgh, New York, and Chandler Horton of Zionsville, Indiana, made incidental contact in the Carousel. The safety car emerged to pace the field as crews cleaned up the wreckage. Both drivers were unharmed but the damages sustained from the incident ended the F4 U.S. sophomores’ day. On the restart, Dickerson defended his first-place position as Rasmussen tried to overtake the California native. The move yielded unsuccessful and Dickerson pulled away once again. Shortly after going green another full course yellow was thrown when Justin Gordon of Lake Worth, Florida, clipped the rear of the No. 06 car of Jake French of Royse City, Texas, sending French airborne into the tire wall. French landed sideways upside down on the barrier. The Skip Barber Momentum F4 driver was transported to the track medic center for routine check-up, and was released without injuries. The extensive clean-up ate critical minutes off the 30-minute clock and the session expired under yellow conditions. “Finishing a race under yellow is unfortunate, but a win’s a win ad the points are really great,” said Dickerson. James Raven of Portsmouth, England, finished Round 7 in fourth, Pedersen charged his way from 11th to finish fifth, with Arthur Leist of Novo Hamburgo, Brazil, Joshua Car of Sydney, Australia, Miller and Conrad Clark of Taupo, New Zealand, completing the top-10. Further down the field, Dylan Tavella of Massapequa, New York, and Parker Locke of San Antonio, Texas, also had an exceptional race. In just three laps of green flag racing, the pair advanced more than 10 positions in the first round. The final two rounds of the Mid-Ohio weekend start Sunday. Race 2 begins at 10:15 a.m. ET with Dickerson staring pole. 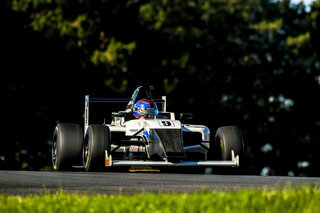 The weekend concludes with Race 3 at 1:55 p.m. Visit F4USChampionship.com for live timing and scoring, results, photos and more information regarding the series.